Here we go! 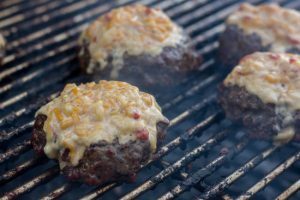 Spring is here and the weather is mild and just perfect for lighting up the grill or smoker. 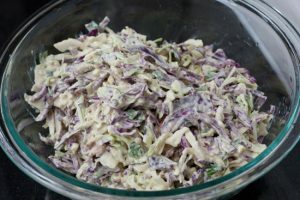 I figured since everyone is going to be looking for a fun weekend recipe to test out that I might as well post this easy and totally awesome recipe for a buffalo chicken fatty. What’s a fatty you ask? Keep on reading. Take two boneless skinless chicken breasts and pound them flat using a meat tenderizer. I put two breasts in a zip top bag and beat them down to an even thickness. Once the breasts are flattened, move them aside. Next using 1 pack of bacon make a bacon weave. Your weave doesn’t have to be perfect but it does need to be able to stay together. Here is a really nice tutorial on how to make a bacon weave: BBQ-Brethren Bacon Weave. If the images of the weave in this link don’t show up you may have to login. Position the chicken breasts in the middle of the bacon weave. Liberally add about 1/4 cup of hot sauce or any type of wing sauce that you like. I used straight Frank’s hot sauce. Add about 4 cloves of diced sauteed garlic on top. Put a handful of crumbled blue cheese all over and then sprinkle about 1/4 cup of shredded parmesan cheese all over. If you are familiar with this blog you’ll know I posted a garlic parmesan hot wing recipe a while back that was an attempt to recreate the wings from a little dive bar in Baltimore called Kislings Tavern. They used to have the best wings ever. They were so spicy and the recipe appeared to be a nice hot sauce with the addition of garlic and parmesan cheese. I’m now a bit partial to the addition of garlic and parmesan cheese to any hotwing recipe. Now comes the fun part. Carefully grab one side of your bacon weave and roll the Buffalo chicken fatty. Once it’s rolled up carefully put it on a rectangular piece of aluminum foil. This helps with transfer to the smoker and also removal from the smoker. Typically, a bacon explosion is smoked at 250-300 degrees F for about 1-2 hours. I use apple wood. 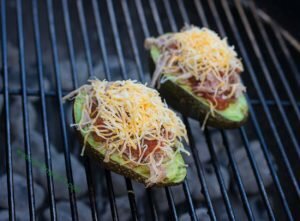 However, this can easily be made on a charcoal or gas grill. If you use a grill you can add some wood chips throughout the cook to get the smoke flavor or just skip the smoke all together. It will still be great, regardless. All you really need to do is cook the chicken and bacon. Speaking of cooking, you will know your fatty is done when a thermometer put into the center reaches at least 165 degrees F.
You have some options during the last 30 minutes of the cook. You can leave the fatty sauceless, or use anyone of your favorite BBQ sauces and brush it liberally. This adds a nice flavor to the fatty. I really liked this buffalo chicken fatty. It’s the best of both worlds! Bacon and hot wings! 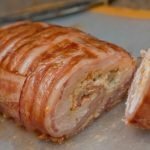 Bacon Explosion recipes are incredible. This one changes things up with chicken and buffalo wing flavors. Put flattened chicken breasts on top of bacon weave. Add hot sauce, sauteed garlic, blue cheese, Parmesan cheese on top of chicken. Roll it up into a cylinder shape and sit on a rectangular piece of foil. Smoke or grill at low temperature (250-300F) until temperature in the center reaches 165F. About 30 minutes before it is done brush some BBQ sauce on top (optional). Next PostWhat is a Pub Burger? You lost me at blue cheese.